If you agree that the MLB season represents a marathon and not a sprint, then the last 15-16 games must represent the last 2.6 miles to the finish line. Unless you can expand your finishing kick over that kind of distance, then a good portion of that can become more of a crawl than a sprint. For the Cardinals the crawl may actually be downhill with a slight uphill run to the finish line. The Cardinals are 6-3 against Houston this season and 8-6 against the Cubbies. If the Cardinals can manage something like a 6-3 record over the next 9 games, perhaps the uphill finish won’t even matter. After all, the numbers favor the wild card leaders right now. The Dodgers play the next 9 games on the road against WAS (3), CIN (3), and SD (3). The Dodgers own a season series advantage on all 3, but most of those games were at Dodger Stadium. If the Dodgers go 5-4 or worse on the road trip, the magic number for the Cardinals to clinch the 2nd wild card spot could drop to 5 or less with 6 games to play. This should not be misconstrued as discounting the Brewers, but the Brew Crew goes on the road for the next 10 games to face the Pirates (3), Nationals (4), and the Reds (3). Even a 6-4 run could leave them a 4-spot from elimination. A 2.5-game deficit may not seem monumental, but the Brewers have to leap over 2 teams to take the 2nd wild card spot. The Pirates find themselves in a similar situation only with a slightly easier schedule (in theory). The one factor they might struggle to overcome is that the team sits 3 games back of the Cardinals, and the Redbirds have 4 games in hand on the “win” side of the equation. The Cardinals could end up with a losing record in the crawl to the finish, and the Pirates would still have to go 11-6 to finish in a tie. The 2nd wild card invitation certainly appears to be still up for grabs, but the contenders are all slowly running out of games to play. That’s great news for the Cardinals, despite the recent road trip out west. While a split with the Dodgers did not help pad the lead at all, it did cross off 4 days from the calendar, and that’s pretty much the objective now. Follow gr33nazn on Twitter for more about crawling! Since going 3 for 4 against the Padres on September 10th, Pete Kozma has posted a line of .200/.250/.400/.450. Behind Yadier Molina‘s team-leading 2.5 dWAR, David Freese stands 2nd at 0.6 dWAR. Jon Jay, Skip Schumaker, Shane Robinson, and Adron Chambers round out the top 3 as all 4 are tied at 0.3 dWAR. Pretty impressive numbers considering Chambers has only played in 33 games. To this point in the season the Cardinals have only 4 complete games, and 3 were thrown by Adam Wainwright (the other was Westbrook). Allen Craig has had 109 at-bats with runners in scoring position, and he has 64 RBI and a line of .404/.466/.679/1.145 in that situation. Matt Carpenter – .318/.396/.488/.885 against RHP with 1 HR and 30 RBI in 202 PAs, 258/.295/.483/.778 with 5 HR and 14 RBI in 95 PAs. 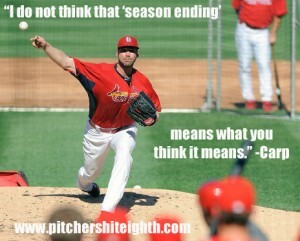 The 2012 Cardinals have made it through 147 games with a 77-70 record. The 2011 Cardinals were 79-68 through the first 147 games. From 2004-2011, Chris Carpenter was worth 26.3 WAR for about $70M despite making only 194 starts. Yeah, he’s been missed.